The new Sutter Slim Backpack provides special pockets to store your Apple gear. 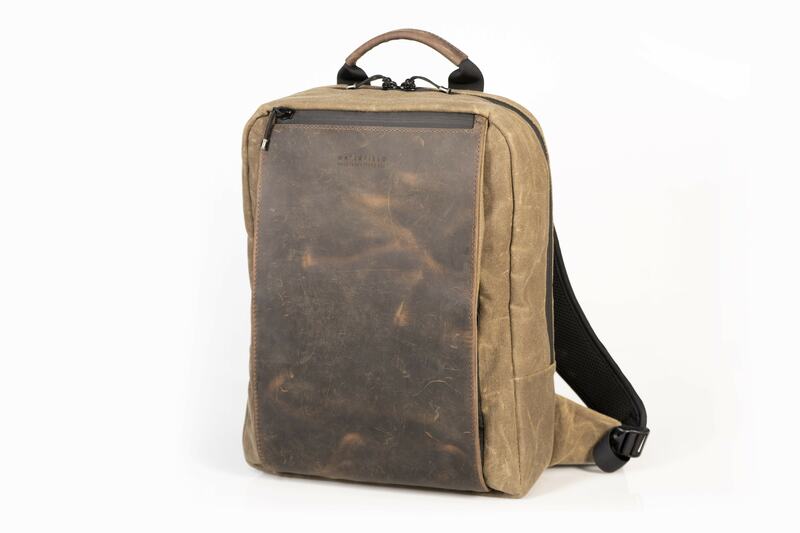 WaterField Designs’ new Sutter Slim Backpack keeps a low profile while swallowing up a 15-inch MacBook, a 12.9-inch iPad Pro and a bunch of other gear. A few neat features make it sound like a pretty great way to carry all that tech we drag around everyday. Wait, what? Who even knew “executive backpacks” were a thing? Not me. But I guess they totally are. The tan waxed canvas with chocolate leather accents looks classy. • Plushly-padded compartments cushion a 15-inch laptop and 13-inch tablet. 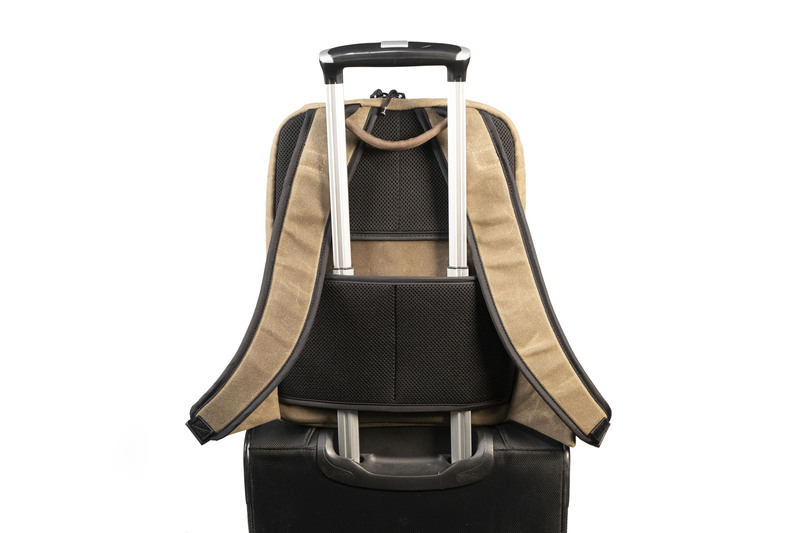 • Rear panel slides over wheeled-suitcase handles for hands-free airport navigation. • Efficiently-placed pockets in distinct zones prevent bulging and insure a balanced carry. • Exterior top pocket closes with YKK waterproof zipper — ultra-convenient for quick access especially when the bag is set down or resting on suitcase handles. • Interior open-topped pockets organize tech accessories. • Swing-around front pocket, accessible from either side with the bag still on one shoulder, lies behind a full-grain leather panel that extends beyond the zippers to protect contents from the elements. • Key fob inside the front pocket allows quick key retrieval without fully removing the bag. • Gold, water-resistant liner lights up the interior for increased visibility. • Stiffened side and bottom panels prevent sagging and help keep bag more upright when set down. • Ergonomic, padded shoulder straps and rear mesh padding enhance comfort and airflow. • Comfortable leather handle facilitates an easy grab-and-go from a car seat or overhead bin. • Rugged tan waxed canvas or black ballistic nylon with a premium full-grain leather panel presents a look that will upgrade any wardrobe. The Sutter Slim Backpack plays nice with rolling suitcases. The rear panel that lets you attach the backpack to a rolling suitcase should be a godsend for travelers. And the sag-busting hardened side and bottom panels sound like they will make the backpack work more like a hard-sided suitcase when you set it down. Also, if you’re familiar with WaterField’s previous bags — and we totally are (just check out all our rave write-ups and reviews of WaterField bags) — you will recognize your color options. The Sutter Slim Backpack comes in two: tan waxed canvas with chocolate leather accents or black ballistic nylon with black leather accents. Both come with WaterField’s cool (and durable) gold liner, which adds a real touch of functional class to the company’s extremely well-crafted bags. All in all, it sounds like a pretty compelling pitch. It had better be: The Sutter Slim doesn’t come cheap. The new tech backpack goes for $229.99. 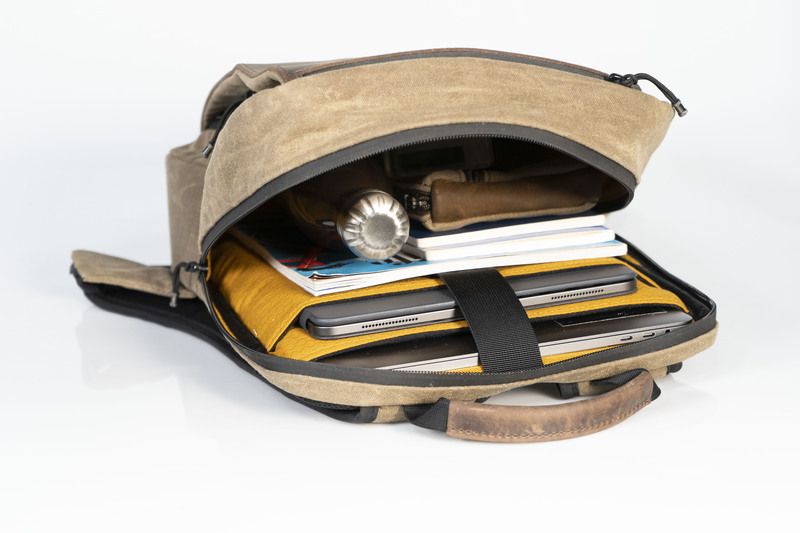 Order a Sutter Slim Backpack by Jan. 31 and WaterField will include a free Tech Pocket for organizing all your cables, dongles, etc. The backpacks begin shipping Feb. 1.